Ergo Factor is the backbone in developing an age-defying golf swing, on and off the course. Ergonomics maximizes the golfer’s natural potential. The golfer’s alignment, pivot points, and how the golfer synchronizes their elbows with the shoulders are essential for control and distance in the golfer’s game. Ergo Factor allows the golfer to be a more finessed golfer, rather than trying to overpower the golf swing with shear strength and muscle. The X-Factor, an age-defying golf swing, is the difference in the rotation between the golfer’s shoulders and hips. The X-Factor is one of the key elements, not only in the takeaway swing, at the top, but also at impact for the golfer to create lag the essential power and speed the golfers relying on. To develop the an age-defying golf swing X-Factor at the top of the swing and at impact, the golfer must set up the necessary orientation in their setup position at address. One key is the Ergo Factor that is the first (E) component of the ESPY APP. The golfer must ensure that they bend at the hips and not at the waist to develop the proper X-Factor for an age-defying golf swing. 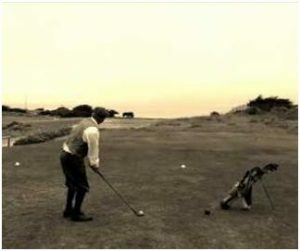 If you watched the movie The Greatest Game Ever Played, you will see Luke Askew playing Alec Campbell taking a stick and positioning it across Francis Oulmet hips instead of Francis’ waist, to me this was a key point in getting Francis ready for the U.S. Open. How to avoid lower back issues in your golf game. Bending at the hips has more advantages than just providing the golfer with the power and speed they are relying on in the X- Factor. It prevents injuries to the golfer’s lower back, in the lumbar area. The discs in the back are unique in that they are 75 percent thicker in the front of the disc than in the back of the disc. If the golfer pushes the fluid in the disc backwards by bending at the waist, the pressure can cause bulges in the wall of the disc, leading to a herniated or ruptured disc later. 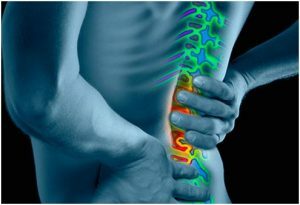 This disc issue can cause pain and become a debilitating situation for the golfer. The reason that I wrote this article is due to an interview John Cook had on Golf Channel. I think John mistakenly stated incorrectly to bend at the waist, instead of correctly bending at the hips, which is proper. To prevent future back issues, the golfer needs to make a conscious effort to bend at the hips, instead of the waist, as John incorrectly stated during the interview. If the golfer doesn’t make a conscious effort, they can bend at the waist, instead of the hips. This not only applies to golf, but during the routine course of the day. You’ve seen illustrations of golfers at address with a shish kabob, running from the top of the golfer’s head down through the golfer’s tailbone into the ground, with the back straight to slightly curved toward the ball, this is the proper set up. To obtain this position, the golfer needs to bend at the hips and not at the waist. 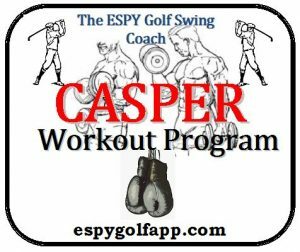 This allows the golfer to set up the other ESPY APP components of Sync, Preset, and Yaw. The first two components (Sync and Preset) are accomplished just by presetting the wrists in the position below. This takes tremendous torque off the lower back. 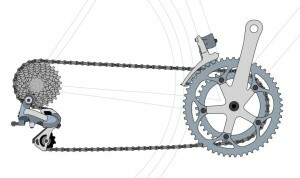 10-Speed Bicycle Sprocket Mechanics, essential for the golfer. Power– In the golfer’s swing with the elbow rotating the shoulders to coil the core body, especially the hips. Speed– At impact where the shoulders are rotating the elbows. A great mental image to properly bend at the hips is to act like the golfer is sitting on the edge of a barstool. There are two bends needed at the knees and the hips. 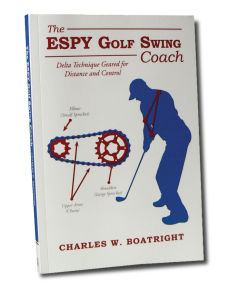 This is covered in Section 12 of my book, The ESPY Golf Swing Coach.